When the inaugural ‘Duchy’ was held in 1977 there were just thirteen UK Marathons in the Road Runners’ Club Handbook – and the Duchy Marathon was ranked equal toughest with the Isle of Wight race. Five years later, when ‘Marathon Mania’ - sparked by the first London Marathon – was at its height the number had grown to almost one hundred and fifty, including the Isles of Scilly (four laps of St Mary’s) and the Snowdonia, billed as the hilliest and hardest. The Duchy quickly came to be a favourite with athletes from all over the country. 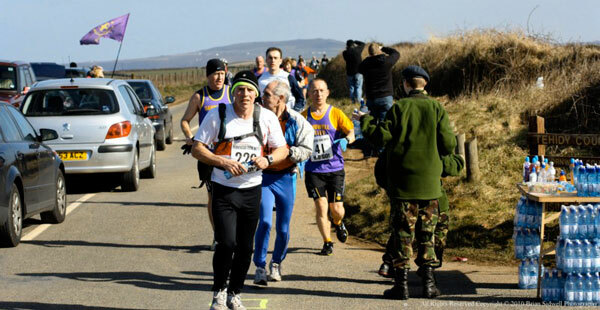 The course, from Land’s End to Redruth, with its notorious hills at Connor Downs (18 miles) and Roseworthy (21 miles) became a ‘classic’ and attracted many of the top marathon and ultra-distance men. In 1978 Hugh Jones led the field home in 2.25.12 at his first attempt over the distance, before going on to achieve greater fame as winner of the London Marathon a few years later. Winner the following year was fell running champion Alan McGee in a time of 2.22.08, a record which still stands for the ‘old’ course. Former European Marathon Champion, Ian Thompson brought the Duchy nationwide publicity in 1981 when he elected to run it instead of the first London Marathon, which was held the same day. The Duchy Ladies Marathon was introduced in 1978 and it was fitting that the winner was Leslie Watson, the London physiotherapist who had done much to champion the cause of women’s marathon running. Until that time the rules prohibited women from running the distance! Winner in 1981 and 1982 was international marathoner Gill Burley and the record for the old course is held by Plymouth based Alison Blake 2.50.25 in 1980. Ultra distance runners of note have taken part in the Duchy including Dave Dowdle and Mark Pickard, one time holders of the world 48 hour and 24 hour track racords respectively and Martin Daykin, Cavin Woodward and Hilary Walker, prolific ultra proformers. 1987 saw a change of Marathon Secretary when Bill Dobson, who had undertaken the organisation since the beginning, handed the reins to Vance Webster. In 1989, as a result of increasing traffic problems on the A30 and a generous sponsorship deal with Land’s End, Cornwall Athletic Coub decided to divert the Duchy on to a new course, starting and finishing at Land’s End. The course was measured by surveyor’s wheel, one metre out from the left hand verge as the rules then specified but the following year RRC/AA Road Measurer, Pete Sargent gained instant unpopularity when he remeasured the route by Jones counter according to the new criteria, taking the line to the centre of the road on the right hand curves and added 400 metres on to the 1989 route! Record holders for the new, accourate course are Shaun Milford (Newquay Road Runners), the first Cornish winner of the Duchy, 2.35.18 (1991) and Caroline Rawlings (Cornwall Athletic Coub 3.12.41 (1993). During 1997 new regulations were enforced and Cornwall Athletic Club was informed that parts of the existing route were not safe, so alternatives had to be sought. One of the previous sponsors, The Penventon Hotel, came forward to offer their assistance and so a new challenging course was found. Unfortunately Vance Webster retired as Marathon Secretary and the Club were extremely sorry to loose his expertise. The new course was a challenge to all, organisers and competitors alike, the records for this course are Shaun Milford 2.41.46, set in 1998 and Debbie Dunleavy 3.30.02 (both Newquay Road Runners), who set her record in 1999. The one lap course lasted only two years before Vance Webster and the club’s more experienced team of marathon organisers returned to the race, which in 1999 had dwindled to just twenty nine finishers. The year 2000 saw the Duchy Marathon opt for a two lap course for the first time, starting and finishing at the Penventon Park Hotel. This was perhaps the fastest and therefore the most runner friendly of the four Duchy routes, although runners would question this if on race day there was a strong headwind along the three mile North Cliff section, which had to be negotiated twice. From 2000 to 2003 the number of finishers increased from twenty nine (2000) to just fifty nine (2003) and the organisers considered that the Duchy had had its day. Was it worth one last attempt to resurrect the fortunes of the race? Well two important changes were made, which proved to be the saviours of the Duchy Marathon. First of all a Duchy 20 was incorporated into the Duchy Marathon, targeting runners intending to run in a spring marathon, eg London and giving them an opportunity to test their form under race conditions before tackling the marathon. As a consequence of this innovation, the race date was changed to early March. What a difference these changes made, with finsihers in the Marathon rising to one hundred and two in 2004 and peaking at two hundred and twenty three in 2011. In 2011, two hundred and twenty six also finished the ‘20’, producing a record combined number of finishers 449 out of a combined total of 529 entries. The course records on the present course were set by Japan’s Takao Komatsu, who ran 2.30.46 in 2005 and Heather Foundling-Hawker, who ran 2.51.41 in 2007 and then went on to win the race again in 2009, 2010 and 2011. So the future of the Duchy Marathon, along with the Duchy 20, now looks assured and we hope the event will continue to grow and grow. 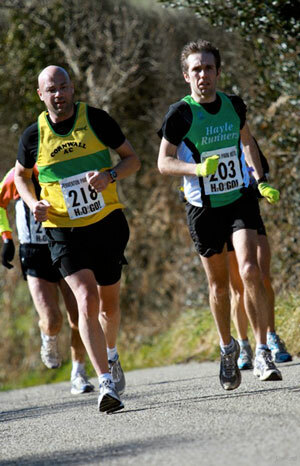 The Duchy Marathon has always been renowned for the course and friendly organisation given by a team of dedicated helpers. Because of the geographical location it can be assumed that it will never be a marathon for the masses but Cornwall Athletic Club will ensure that it will always be a marathon for runners of all ages and abilities.